That said, I feel I would likely lose something of the existing hand-drawn aesthetic if I went fully digital. There are existing digital touches such as the speech and skin tone, but I’m not sure digital lines would work quite so well for this style, to say nothing of having the change mid-issue. At the moment at least, it feels like full colour digital pages are best saved for a new project with a different style. First I settled on digital linework praising its speed and precision over pen and paper, before pining for ink once again under the oppressive glare of my monitor. Big surprise, I’ve changed my mind yet again. I hate being so fickle all the time but I’m increasingly finding it’s better to go with the project’s flow than continue in ill-suited vein out of sheer embarrassment. My issues with Corel and Photoshop haven’t vanished but almost as soon as I began drawing up the current page with my former methods I felt something was wrong. When I say ‘wrong’ I don’t mean in terms of my enjoyment of drawing by hand – that’s unlikely to fade anytime soon – rather how the work fitted with its predecessors; I couldn’t shake the sense that I was wrenching open a chasm in the midst of the comic. While its been a cumbersome improvised evolution, there has been a progression of style throughout the twenty current pages which I think has been for the better. 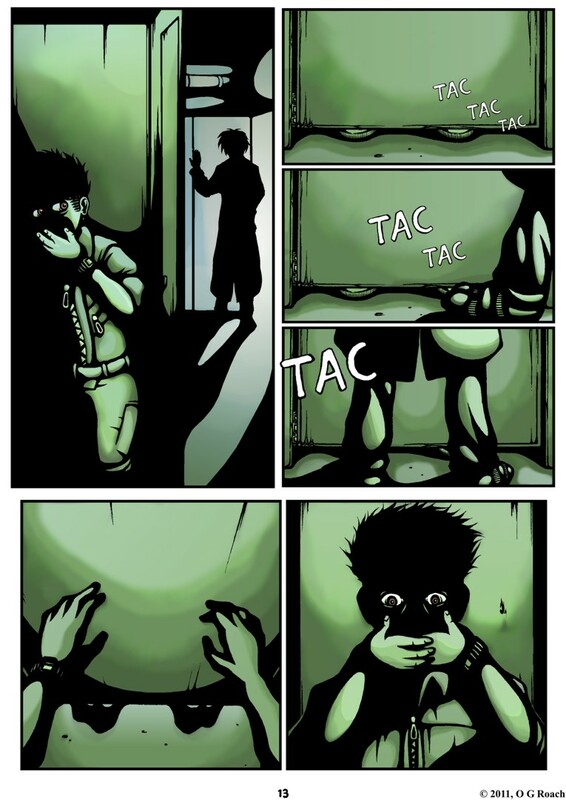 The art’s become crisper and more cohesive in appearance, with a far greater consistency than the initial pages too. The specifically hand drawn touches I used to apply such as heavy hatching weren’t bad in and of themselves but they seemed an increasingly poor fit given Branch’s tone. Cyberpunk is a typically cold genre and while the warmth of traditional art might benefit a different story or look, here it seemed to be working against what I’ve been trying to establish. As I’ve explained extensively before, I may have some issues with making art digitally but the end results are far more satisfactory to me than their hand drawn equivalent and in the end that seems to be a greater priority. There’s nothing stopping me from drawing for recreational purposes outside of the project and I’ll still be sketching the rough pages no matter what; occasionally digital methods can be a drag but no one ever said this would be easy (least of all me). More than anything else though, the sensation which plagued me reverting back to my fineliners was of taking a step backwards, losing progress and a danger of alienating readers. I’m hoping most will be able to overlook the slight tweaks to the art style early on as the quirks of an artist in development, however, if I begin jumping back and forth between methods I’m worried the effect created will be a great deal more irritating; fracturing the comic’s sense of continuity and the credibility of its story world. Digital love? Not quite, there are still areas of production which have me tearing my hair out but overall it seems my initial hunches were right; digital colour AND linework is the way to go and in the long run I feel certain Branch will be bettered by it. I won’t lie, I’m struggling to get my next page done. 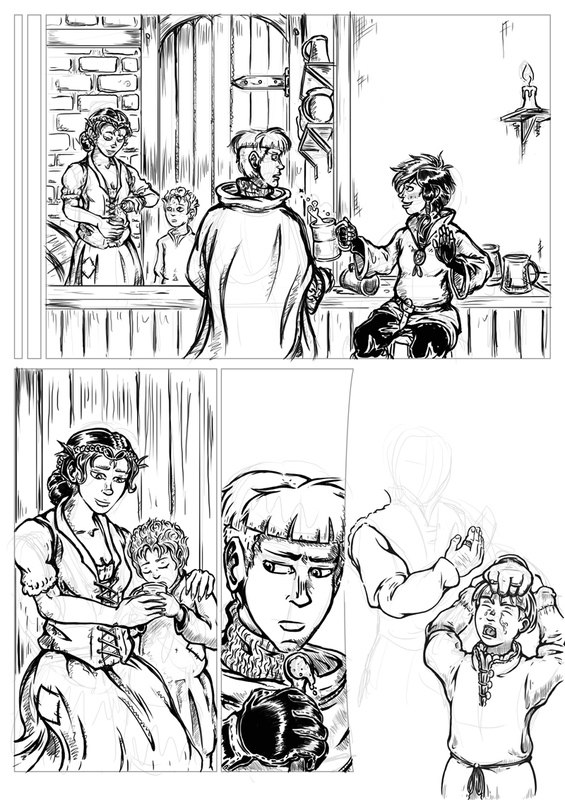 Considering the smaller issues there’s a fairly tricky perspective panel and I took time out last week to visit London again, however I think the problem is a more fundamental and somewhat uncomfortable point; the process of inking digitally is grinding me down. I had a sizable rant before about how the move to digital line work (like the colour) would be for the better and I’ve stated several times that I’m much happier with the quality of the work I’m creating this way, unfortunately I’m not happy with the process itself. It certainly makes high contrast panels simpler to draw up but when it comes to complex images I find myself missing the pen. I may have made a lot of mistakes and drawn a lot of wonky anatomy by hand but it was comparatively quick. Once a mark was made that was it, no erasing a redrawing, I just had to go with the flow and get on with it. I can draw almost as fast in Corel with what may be more control but the temptation to get precious over pointless little details is just too great; what should be a matter of making several considerate strokes for an eye or a nose becomes a convoluted affair of erasing redrawing, zooming and chiselling. I like what I end up with, but who honestly cares after an hour’s been spent on a fingernail. Furthermore, I’ve come to realise that drawing by hand had therapeutic qualities which are simply not there when I stare into a monitor. I can happily sit down with pen and paper for an afternoon, whereas with a computer about 90 minutes in I’ve got a headache and bloodshot eyes. Something which should be a joy becomes a chore and I find myself becoming less motivated and inspired as a result. I realise this is the second time I’ve changed up my work process in recent months and that it’s really too late in the day to still be so uncertain of my methods, nevertheless I feel I have to acknowledge where I’m going wrong and do something about it. The MA is supposed to be about experimenting and developing my skill set, thus forging ahead blindly as I am would be completely contrary to this notion. Following completion of my 20th page I plan on returning to pencil and pen for the majority of my linework, however I shall still be using digital inking for high contrast scenes as with pages 12-17 or anywhere else it seems suitable for that matter. Additionally, to keep things stylistically consistent I won’t be returning to my excessive texturing of old, moving more towards clean edges with occasional light hatching. Put simply, I’ll be striking a firm balance between traditional and digital approaches which should hopefully yield the best results as a whole. Appropriate once again I suppose given my theme, that both I and the machine are still trying to work the kinks out of our relationship and acknowledge respective strengths and weaknesses considerately. Perhaps as with my story it’s somewhere between the old and new that I’ll find my ideal path. This post has been brewing for a while, a decision I grudgingly knew I’d have to make at some point as the problems became increasingly difficult to ignore. Having just redrafted my statement of intent for the MA’s final module, now seems as good a time as any to set things straight and confirm a significant change in my approach. Branch is suffering from an identity crisis. Not in the sense I don’t know what to say with the story or that the characters aren’t clearly defined, no it’s in the style where the problem lies. Starting out with the firm intention of keeping it hand drawn, I took my time penciling and inking the imagery with only colour being done digitally for the sake of feasibility. This method was not without its drawbacks; countless attempts have concluded with slam dunks in the nearest bin while the knife-edge “tremble and you’re screwed” nature of indelible ink often reduced me to a meticulous crawl, still there’s a lot I love about traditional art. The imperfections often give it a warmth which is lacking from clearcut Photoshop lines, while certain techniques such as crosshatching just don’t seem to translate across the computer screen divide. Irrational as it may sound, perhaps my biggest hesitation to embracing an all digital approach was the feeling of bringing a machine between me and what I’m trying to express, introducing a technique which strips away a significant portion of the humanity the work projects. At least, that’s how I felt at first. As I planned out the 12th page and began to introduce my promised noir stylings the first real signs of dissonance appeared. I quickly realised that the hatching I’d been using so extensively up to that point detracted from clearcut heavy black shadowing and highlights I was starting to use, creating something closer to an indecipherable mess than a satisfying image. The two techniques simply cannot occupy the same page without looking odd. I initially assumed this could be dealt with by separating the two looks according to the lighting of scenes and dramatic intensity, but the root of the problem is inescapable. The styles are in a tug of war and until I give myself over to one whole heartedly the end results will always be conflicted. Also weighing in on this matter is my increasing lean towards digital inking over the last few pages; it started out as an experiment with a single panel on page 13 before being applied to whole pages in the last few. In spite of my initial impressions the process works remarkably well with light and shadow imagery, making it more a process of cutting out highlights than awkwardly planning out shadow on paper (I only have so much ink to waste after all). More than anything though it makes production fundamentally easier and quicker all round. Being accident prone with both life and drawing, inking over my pencil plans in Corel lets me make mistakes without having to start again, attempt a messy correction or be forced to settle for something I’m seriously unhappy with. I can work at something that’s easy to erase or modify parts of until I have a satisfactory result. Furthermore, applying colour to lines which are already clean and digital feels like a far smoother transition than scanning linework from paper and performing awkward cut and paste actions. I can’t deny that some things will be lost in this transition, though there are pros and cons to either method; the big difference with using digital linework and a more economical style being that I expect increased productivity and a higher page count by the conclusion of the MA. Hand drawings will continue to play a significant role in my pencil plans and help preserve my general style (as seen above) but thus far everything suggests this new approach will mean far nicer looking pages appearing sooner. I might also add that it seems bizarrely appropriate that I’m letting machines take a progressively larger role in my production process when the graphic is all about human-machine symbiosis. It’s a bittersweet farewell but I guess this is goodbye to excessive crosshatching and hello to Corel. Page 13 + More Life Drawing! This page pretty much continues in the stylised vein the last one did, so much of the composition and its colour choices are for the same reasons. However, as usual there are a few noteworthy additions and decisions. The pace has slowed dramatically and what I’m covering here in three to four pages arguably could have been summarised in one, but still I feel it’s worth taking a pause here. The focus of this scene is upon two things: Curt’s rising fear of cyborgs and Scratch’s imposing, steely demeanour, both of which will be of increasing importance to the central theme of the narrative as it progresses. While previously there was a lot of information imparted through dialogue, here I want the visuals and mood to do all the talking for a moment. Considering the technique itself; while I normally pencil and ink all my linework by hand I do clean it up digitally after scanning and occasionally correct mistakes, with the first panel here I tried something a little different as an experiment. Having penciled the panel in rough I scanned it in and worked over it in Photo-Paint, beginning with a purely black overlay set to 50% transparency and cutting out the highlighted areas. This wouldn’t have worked were it a well-lit scene featuring cross hatching rather than heavy shadow, but in this case the results weren’t half bad inadvertently having a slightly Geoff Grandfield quality. I’m not changing over to an entirely digital production process anytime soon, but I may well dabble in future. My favourite panel is probably the fifth taken from POV, mainly for its simplicity. 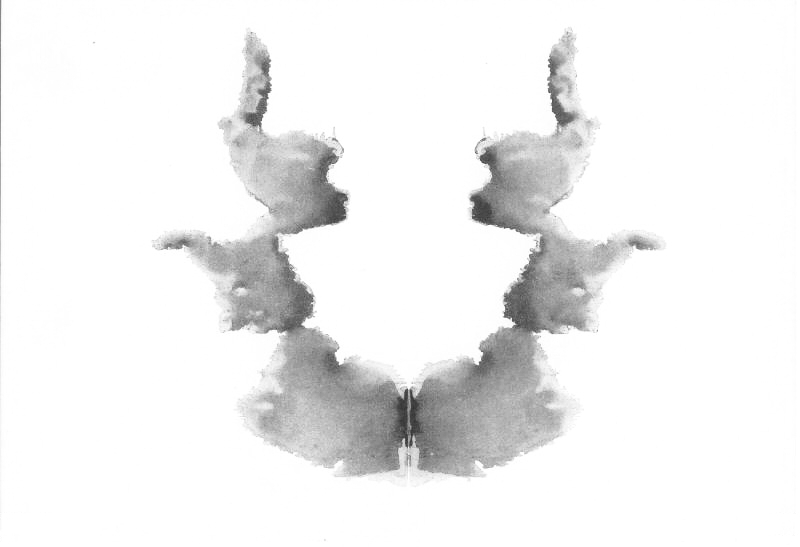 Being almost symmetrical with the shadowing connecting into a surreal whole it has a sort ink blotch feel slightly reminiscent of a Rorschach test card. There’s something surreal and unsettling about it which taps into exactly the kind of mood I want. The weakest panel meanwhile is easily the last one. The way the light splashes across Curt’s chest turned out okay but the hands just look too small, even after I reworked them. …And on the subject of weak anatomy, a spot of good news is that I’ve gotten back into life drawing this week! Despite having the same model as last year the new classes are run quite differently; favouring a series of short three-minute poses alongside a longer one (above – I won’t post the quickies since they’d burn your eyes). Fast drawing is not one of my strengths, but for this very reason perhaps being forced to do so will prove good practice in the long run. Regardless, it’s another step in the right direction to refine my technique and help reduce my anatomical embarrassments.